Warning: Just a quick word, as this review looks back briefly on the careers of Peter Cook and Dudley Moore, it features slightly more colourful (obscene) language than usual. 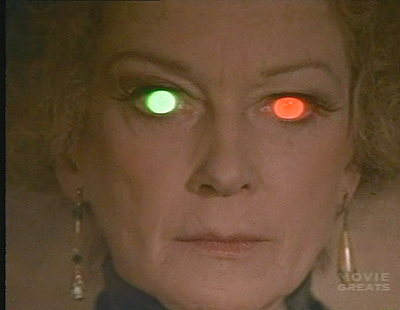 Many years ago, when I first tried to watch this version of The Hound of the Baskervilles, I really struggled with it. It was only my devotion to the work of Peter Cook and Dudley Moore, and a desire to watch everything that they did together that got me through. The film is terrible. For this review, I bravely watched it again, and maybe because I have been watching other Holmes films – and variations of this story, I found myself, begrudgingly, enjoying the film. But don’t take that the wrong way. That is not a recommendation, and unless, like me, you are a huge fan of Cook and Moore, I suggest that you steer well clear of this movie. While this film is a Sherlock Holmes film, first and foremost it is a vehicle for the stars Peter Cook and Dudley Moore who came to prominence in the sixties television show, Not Only…But Also. 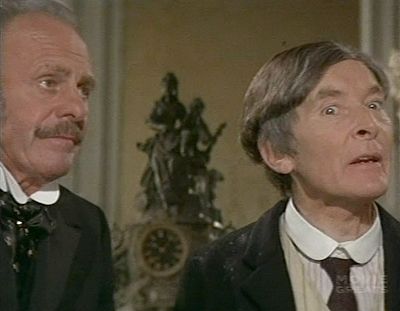 One of Cook and Moore’s first attempts to branch out into cinema was the ensemble piece, The Wrong Box which also featured Ralph Richardson, Michael Caine, Peter Sellers and Tony Hancock. Despite the high profile cast, the film wasn’t a success. Then came Bedazzled. The film is now generally looked upon as being a comedy classic (‘…you fill me with inertia’), but the film only did moderate business in the UK and the States. Audiences in the UK were not prepared for the shift away from the established characters that Pete and Dud had established on television, and US audiences were never going to fully embrace a movie without American actors in the lead (apparently it was a surprise hit in Italy where they had never heard of Pete and Dud). Next was Monte Carlo or Bust – which was known in Australia (and I think America too) as Those Daring Young Men in their Jaunty Jalopies, hoping to rekindle the success of Those Magnificent Men in their Flying Machines. It too tanked. Soon afterwards, through ennui and depression overcame Peter, and his enthusiasm for the Derek and Clive project dwindled to zero. …but at the end of the year in which he [Peter] felt directionless and shorn of inspiration, Derek and Clive represented a useful stopgap, a ready-made, off the shelf entertainment that could be released without undue exertion on his part. A deal was done with Chris Blackwell of Island Records, who issued Derek and Clive (Live) – the original title had been Derek and Clive (Dead) – in August. Now where does The Hound of the Baskervilles fit in? The film was made as a reaction to Derek and Clive (Live). Cook and Moore’s smutty recording had made them famous once more. And you must remember, this is before Dudley Moore had success in Hollywood – this is a few years before ‘10’ and Arthur transformed Moore into a diminutive superstar. They were on a roll, and most importantly offers, and money began to come their way. …but far more importantly, Michael White’s company let it be known that they would be prepared to finance a Cook and Moore film. It was the opportunity to revitalise both their careers that both of them had been waiting for, and Dudley had no option but to climb ruefully back on board. …then sat down with Peter to write The Hound of the Baskervilles, a parody that took its starting point from the Sherlock Holmes sketch from Goodbye Again. Now let’s have a quick look at what was put on screen. 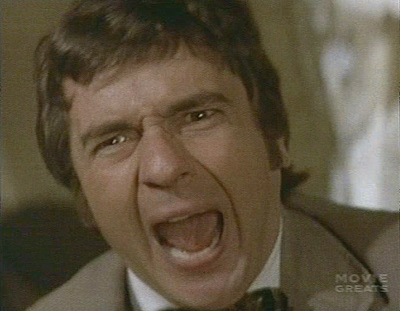 The film opens with Dudley Moore walking out and sitting at the piano and beginning to play…in fact this scene and the closing scene with Moore at the piano bookend the film. They have nothing to do with the story and only serve to highlight what a gifted piano player Moore is. Further evidence of this is throughout the whole film, where Moore provides the musical score – mostly in the style of a silent film. 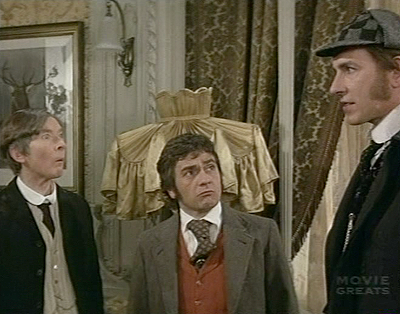 After Moore’s musical interlude, the film cuts to a prologue where three French nuns pay a call on Sherlock Holmes (Peter Cook). Holmes has been hired to find a holy relic (Saint Beryl’s elbow) that has been stolen from the church. The nuns are fearful because it is only days before the ‘Festival of St. Beryl’ where thousands of blind cripples are flocking to the Chapel to kiss the holy relic, which at this point one of the nuns beseeches Holmes to find the relic ‘in the name of all the flocking blind cripples’. Get it? No, you’re right, it is not very funny. But that kind of forced humour sums up the film really. After the title sequence, Dr. Mortimer (Terry-Thomas) visits Holmes and Watson at Baker Street. He explains that he is the executor of the Baskerville Estate, which is valued at over a million pounds (mostly property). The last master of Baskerville Hall, Sir Charles Baskerville died a most unusual and supernatural death, believed to be at the jaws on a gigantic hound. Mortimer further explains that a ‘gigantic brute – a veritable hound form hell’ has been the cause of death for the preceding masters of the Baskerville Estate too. Reluctantly, Holmes agrees to meet to new heir to the Baskerville Estate (‘reluctantly’ because it would appear that Holmes has better things to do with his time like visit massage parlours). At the meeting, the new heir, Sir Henry Baskerville (Kenneth Williams) explains that he is fearful for his life, because on the previous evening someone stole one of his boots. It is surmised that the scent of the boot, will be used to lure the hound to Sir Henry. Holmes thinks it is all nonsense, and he is unavailable to take the case. He assigns Watson to resolve the mystery in his stead. So Watson, embarking on his first solo case, meets Dr. Mortimer and Sir Henry at the railway station and they travel to Baskerville Estate where they receive a very cool welcome from the very, very strange people there – that is, the suspects. Conan Doyle’s The Hound of the Baskervilles only provides the vaguest framework to hang this comedy on. The plot, what little there is, veers from the text quite often in clumsy attempts to get laughs. Unfortunately these attempts to get laughs are so forced that they produce groans rather than belly laughs. 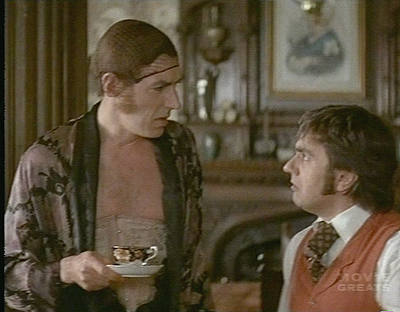 The Hound of the Baskervilles was not to be Peter Cook’s last association with Sherlock Holmes. 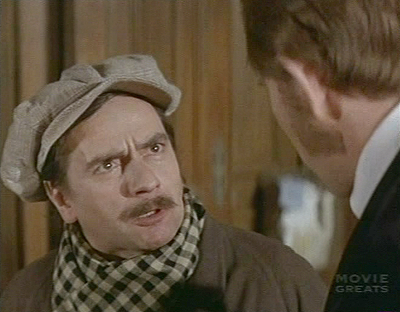 He also had a small cameo as the editor of the Strand Magazine in Without a Clue (another Holmes comedy), which featured Ben Kingsley as Watson, and Michael Caine as an actor playing Sherlock Holmes. 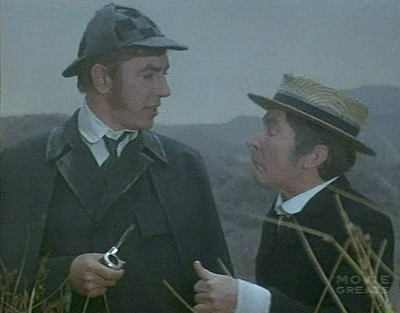 The Hound of the Baskervilles, whilst being pretty terrible as a film, may be an interesting curio for the well-versed Holmes fan, but the people who would get the most enjoyment out of the film are fans of Peter Cook and Dudley Moore. This may be the nadir of their professional careers, but there are one or two sparks that are vintage Pete and Dud; such as the classic ‘One leg too few’ sketch – unfortunately these have very little to do with the story. And for those of you in the know, can I offer two final words: ‘The’ and ‘And’. "The" and "And", David have you been reading my diary? But I have to agree with you the film does stink.